Ahh! This chart is SO true! I'm working on my third one now (or I should say avoiding working on the third one) and am at point four in your chart. I do not look forward to the next couple of steps, but really look forward to getting to that blissful state of resignation. So where's the Hugo Award on that chart? Seriously, best of luck with the novel. Like formal plotting, outlining is something I have an inordinate amount of trouble with, mostly due to my rampant elitism: outlines are for people for whom writing is work, you know, not for those of us for whom it is a glorious artistic pursuit. I'm finding I have to weed out an astonishing amount of this sort of cruft before I can really make a decent start at anything. I look forward to reading more about how you tackle the process. There's a legal alcohol limit to blogging? I'm really looking forward to the [novel] outlines vs. organic [vegetables] post! Erin: There is; you certainly don't ever want us to catch you slipping below the legal limit. Could you give me a recipe for the best thing to cook for yourself when you reach the "dark night of the soul" part? Like Barzak said this is SO very true. Richard Butner says Rye is also a good choice instead of bourbon and I agree. So what you're saying is, when things are going south, turn to alcohol and it'll see you through. Good to know I'm not alone. 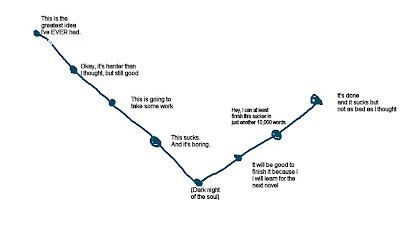 So far I've track very close to your chart and I'm at point six (my next novel will be great because this one stage). I do find that I go back and forth from point 3 to 6 with nasty frequency. Works just as well for business ideas and software projects. Nora Ephron prescribed mashed potatoes for heartbreak, and I think you can go off-label and make them/take them for Dark Nights of the Soul too. The secret is to drag out your mixer and beat all the lumps out and some air in - but do NOT use a food processor or they will turn elastic and evil on you. If you also take a medicinal dose of booze you will forget what a hassle it is to clean your mixer. I'm putting together a couple of workshops for writers and editors and I'd like to use your diagram. Will you charge a fee, and if so how much?